In the last chapter, the comparisons done in that study only took account of typical floor plans; they did not consider the area breakdown of the whole block. As such, any amenities for social use found on the ground floors or on intermediate floors of these blocks were not considered. In a new study, we compared the Sky Neighbourhood layout with the selection of apartment layouts for public housing in Singapore that we’ve just looked at. The area breakdown of each apartment block is calculated starting from the ground floor up to the top floor. All the examples we looked at were of single blocks, except for Pinnacle @ Duxton project, which comprised seven blocks connected at the bottom, middle and top floors. To better compare it with the other conventional blocks, only one block of this project, Block E, was drawn up and analyzed. Among the Singapore examples, the most efficient layout in terms of Sellable Area is 710 Ang Mo Kio Avenue 8. It is also the Singapore example with the lowest percentage of Circulation Space at 8.7%. This is a very leanly designed tower block where the four apartments on each floor have doors opening directly into a central lift lobby. On top of this the whole block is serviced by only a single escape staircase. Being 25 stories tall and having a small footprint, the amenities - located in the void deck on the ground floor - also made up a small percentage of the total built-up area, ie. 3.9%. The Singapore example with the most generous provision of amenity space, which is 6 Ang Mo Kio Avenue 3, the 11 storey slab-block with a large ground floor void deck. How is the High-Rise Honeycomb example compared with the others? The Sky Neighbourhood layout, in comparison with the Singapore examples, produced breakdown percentages that are quite unprecedented. The amount of circulation space is very low – at 4.8% it is less than half of the most efficient Singapore example. In the Sky Neighbourhood, corridors have been eliminated: here access to the apartments is via the communally owned gardens in the sky-courts. The Sky Neighbourhood model also has a very high percentage of amenities area. 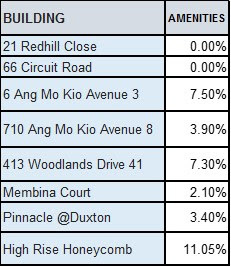 At 11.05% of the total built-up area, this is 50% more than the Singapore example with the most generous provision of amenity space - which is 6 Ang Mo Kio Avenue 3, the 11 storey slab-block with a large ground floor void deck. In terms of internal apartment floor area expressed as a percentage of the total built-up area, the Sky Neighbourhood layout at 78% has about the same efficiency as the fourth most efficient Singapore example, 6 Ang Mo Kio Avenue 3, at 77.9%. However, when the external area is added on to the internal apartment floor area, to get the total saleable area, expressed as a percentage of the total built-up area, the Sky Neighbourhood layout at 84.1% has about the same efficiency as the second most efficient Singapore example, Membina Courts, at 84.4%. The difference is that whereas the private external areas in the Singapore examples are balconies, in the Sky Neighbourhood model, they are the private gardens that serve as a buffer between the communal sky-court garden and the apartment front doors and windows: an arrangement that mimics the front yards of low-rise homes. How does Pinnacle@Duxton compare with the others? It achieved a rather low yield on sellable area at 75.6% even though this is a Slab-Block with double frontage corridors. But the high percentage of circulation area can be easily explained by the provision of 5 lift cores in the lobby to provide for this 50 storey building. As mentioned earlier, the celebrated Sky Terraces at the 25th floor do not make up such an especially high percentage of the total built-up area. An old slab-block from the 70’s may have had one void deck on the ground floor below a 10 storey block. The tower block from the 80’s, or a cluster block from the 90’s, would also have had a single void deck on the ground floor below a 25 storey block. The void decks on Level 1 and the Sky Terrace of the 50 storey Pinnacle@Duxton, expressed as a percentage of the total built-up area, in fact make up a smaller percentage than that achieved by the older, lower apartments which have void decks on the ground floors like the slab-blocks at Ang Mo Kio Avenue 3 and Woodlands Drive 41. The innovative Pinnacle@Duxton apartment is without doubt a seminal building that set off a new positive direction in the design of high-rise apartments. It was sold at what were very attractive prices and on launching, were oversubscribed many times. However, this was a subsidized housing project by the Housing Development Board that believed (correctly in my opinion) that the design inefficiencies inherent in the provision of the sky terraces were merited and the extra cost of building this project was well worth it! So, this new study shows that providing green social spaces as additional amenity areas added to the floor plans of conventional corridor of lift lobby layouts introduces inefficiencies in the design. It also corroborates with the findings of our earlier study: that by replacing corridors with sky-courts, cost savings can be made while at the same time improving the social quality of high-rise. GET A FREE HARDCOPY OF THIS BOOK IN FEBRUARY!! Please help me proof-read this book. Just point out the errors in the comments section (look at the bottom left hand side of each post). I'll post this book to the first reader who spots 5 mistakes...!